Food in York, North Yorkshire. So far we have raised a few eyebrows with our name, and many have said that our interior is certainly quirky if not a little risqué, all of which we love as we want to be unique and fun. 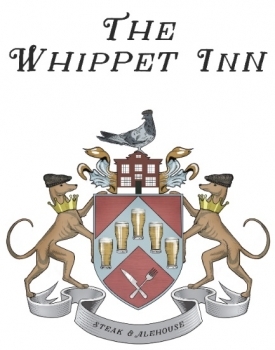 When it comes to the food and drinks we serve however; we are very serious...When we set about creating The Whippet Inn our main aim was to get the best food produce we could find in Yorkshire and then pair it with real ales, lagers, spirits and wines from around Great Britain. Yorkshire beef is our thing offering you 28 day or 40 day aged beef but we have something for everyone, be it, lunch & a lite bite, dinner or just a drink in our bar.Our bar is an eclectic mix of Real Yorkshire Ales - right through to over 30 bespoke gins- we maybe small but we have used every nook and cranny to ensure we have an amazing range to offer our quests. All this is delivered with down to earth homely Yorkshire hospitality. Another of our aims was to create a place where our guests could enjoy themselves with friends over dinner or to have a relaxing drink in the bar , a kind of home from home.